KoopaTV: Saying eSports Are Sports is NOT a Liberal Conspiracy! Saying eSports Are Sports is NOT a Liberal Conspiracy! By LUDWIG VON KOOPA - It's actually a conservative notion to make. On Tuesday, a novice guest host substituting for Rush Limbaugh, the greatest radio talk show host in history, made the claim that the movement to call eSports a type of sport is part of the liberal war against truth and words, done by the same people who are pushing the notion that men should be able to identify as women. His name is Todd E. Herman, and he's otherwise known for being a former “New Media Director” (digital strategist) for the Republican National Committee. Previously, Mr. Limbaugh has provocatively stated that people who play videogames are among the least successful of those in society, and now his guest host is taking it a step further. Mr. Herman's (not to be confused with KoopaTV inspiration and another conservative radio talk show host, Herman Cain) argument is that once you devalue the meaning of words like sports and gender, liberals will go after freedom and liberty as well. Once those are out of the picture, then the American experiment is over, so you got to stop the left-wing slope of slipperyness by opposing the eSports are sports movement. For the record, the results are pretty consistent that eSports are nowhere near the popularity of “traditional sports” and that even gamers who would vote on the GameFAQs poll of the day are much more likely to spectate traditional sports than an eSport. A plurality of gamers don't associate with any sports. Mr. Herman initially defined sports as about a pursuit of competitive excellence, with a handshake at the end. As the program continued (he spent a couple of minutes on eSports and tried to spend the rest of the program on topics such as Iran and terrorism), he kept getting phone calls about only eSports. It seems that the conservative-leaning Rush Limbaugh audience disagreed with the premise that the growing popularity of eSports is a liberal conspiracy! Just getting it out of the way: This article's premise is not that right-leaning people think that eSports/gamers/gaming are bad or anti-American or liberal. Most right-leaning people, if the caller volume was any indication, disagree with this particular host. I do too. Todd Herman increasingly made more and more ridiculous statements as the hours continued, including comparing the idea that playing videogames could be a sport to saying masturbation is a sport. (Free-form activity is not a sport or a game, because games have rules, and all competitive sports are also rule-based.) He changed his definition of sport to require immense physical activity and risk of injury. Let me just state now that when the whole point of your argument of saying that eSports cannot be called sports is because you want words to have meaning, and then you shift definitions during your debate, that you have invalidated your own argument. If your definition is that a sport requires physical activity, then what do you say to the serious folks in Scandinavian countries that offer an eSports alternative to traditional gym class? Those classes still require their students to do physical activity, because it benefits their gameplay. The idea that eSports athletes just sit on the couch and twiddle their thumbs all day is out-of-touch for what really goes on. Plus, just like physical sports, eSports has big risks for physical injury. Just Hax or Mew2King. The Super Smash Bros. community even made a meme of “Go see a doctor” whenever Mew2King appeared, since he often complained about hand pains. 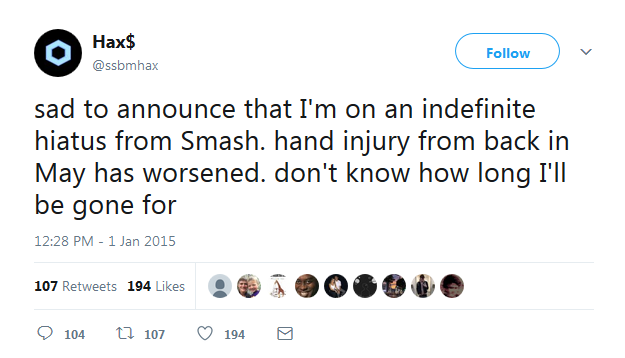 It turned out that Hax's FCU (flexor carpi ulnaris) muscle calcified, which is very unusual for a normal person at his age and affects his non-gaming activities. This is analogous to those head injuries the American Football players receive, known as CTE (chronic traumatic encephalopathy). Both eSports and physical sports get scary injuries with scary acronyms. Like physical sports, people retire early from eSports because they physically can't keep up with how demanding it is. I mean, if ESPN considers it sport-y enough and it's getting attention from sports-betting establishment like traditional sports are, and it's physically exerting like sports are, and it has professional leagues like sports do, why not consider eSports a subset of sports? It has nothing to do with politics. It's because they need to be considered sports athletes to get a P-1A Internationally Recognized Athlete visa from the United States government, otherwise they can't enter the United States and play in tournaments here. Unless your game is Starcraft or something, most games have their most lucrative eSports scenes in the United States. You look at that page on the U.S. Citizenship and Immigration Services site, and it's filled with references to SPORTS. There's no special visa for eSports players, so they need to piggyback on this one. It's the visa that eSports players like Sweden's Super Smash Bros. Melee player Leffen uses to get in the USA. Meanwhile, other players like Mr. R (dual citizen of Iran and the Netherlands) were snagged up in things like President Donald John Trump's travel ban. eSports players need to be considered sports athletes to get the visa. It's the classic conservative folk hero story of a little person trying to overcome the mammoth bureaucratic hurdles posed by big government. Conservatives celebrate that all the time, and that's what eSports players do to be able to come to the great country of the United States of America. Shouldn't small-government-inclined people like Todd E. Herman welcome players like that into the country, instead of childishly deeming eSports players getting sports visas as “sit on the couch and eat nachos visas”? That was his response upon hearing the whole visa angle, since he didn't do any research prior to speaking his mind on the air waves and didn't know that was a thing. What a novice! Believe me, eSports competitions have come a long way, and have moved far, far past the couch and nachos — hence the phrase in the Super Smash Bros. Melee community, “we eSports now.” eSports tournaments filled with creative problem-solvers that are playing in competition, and, yes, they shake hands after play. Ludwig is an arch-conservative and is obviously also a gamer. He wants no part in the war against the TRUTH by the liberals, especially since KoopaTV highly values truth and levity. Ludwig also respects the heritage of the English language and wants words to have meaning, which is one reason why he writes using British English and not this American crap. Anyway, what do you think of Todd Herman's arguments? Do you consider eSports to be sports? If chess is aired on ESPN then I do not see why eSports can't be aired seriously there either. The counter to that, which I'm sympathetic to, is, "Who made ESPN the arbiter of who decides what is a sport or not?" If the point here is that saying eSports are sports is a political statement, then ESPN isn't an unbiased judge, since ESPN itself has been co-opted by left-wing politics. eSports are definitely sports and not just because it is in the word itself. Bowling and archery require no or very little physical activity yet they are still considered sports. Gaming leagues have teams who compete against one another just like any other traditional sport and should be classified as such. Wii Sports considers them sports, but I don't know if Todd Herman would. I mean, all of these edge cases DO have people arguing, if you search for them, that they aren't sports. I've read people say that certain Olympic Sports aren't actually sports and they were added to the line-up just for political reasons.